There is a statement in The Ethics of the Fathers that has puzzled me for many years. The Sages say: “one should not engage overly much in conversation with women. The admonition pertains to one’s wife, all the more so to other women.” My rabbinic training and my experience as a synagogue rabbi and husband has told me the opposite; namely, that I should engage in lots of conversation with my wife because good communication is a key to successful marriage. So how do I reconcile my personal experience with the aphorism of the Sages? Watching The Killing gave me a better idea of what the Sages meant when they discouraged conversation between husband and wife. The Killing details a perfectly planned heist of a race track where the robbers will walk away with two million dollars. However, the plans go awry when one of the robbers divulges the plan to his unfaithful wife. Johnny Clay, an ex-con, has planned a two million dollar robbery of a racetrack. His accomplices are all novices at crime, but each one has a personal motivation for breaking the law. They are all under financial pressure. One needs money to care for his sick wife; another needs money to pay gambling debts. Still another, George Peatty, needs money to give to his wife Sherry, who is constantly complaining about her lack of money and the accouterments of wealth. It is George’s conversation with his wife that proves to be the undoing of the perfect crime. The set-up for the robbery is meticulously orchestrated by Johnny, who determines that the robbery will take place during the seventh race of the day. To distract the police, he hires Maurice, a former Russian wrestler, to start a brawl at the bar in the racetrack. He also hires Nikki, a hired gunman, to shoot Red Lightening, one of the racehorses, to create confusion on the track. During the ensuing melee, Johnny holds up the clerks at the payroll office and makes off with two million in cash. It is then that things fall apart. Sherry has shared information about the heist with her hoodlum lover, Val Cannon, who attempts to steal the proceeds of the robbery. A violent showdown between Val and his partner and the men who actually facilitated the robbery ends in bloodshed and Johnny has to improvise at the last minute to salvage his money. An analysis of the fateful conversation between George and Sherry is instructive. All they talk about is money and material things. The dialogue has no connection to matters of the spirit, only to matters of the flesh. What is discouraged by the Sages is idle conversation, not serious discussion about domestic issues. That kind of constructive discourse is encouraged. It is important for couples to share information about what is on their minds, what activities they should do, what challenges they are facing. It is good when husbands and wives indicate that they value the thoughts of their significant other. It is not wise, however, say our Sages, to complain about other people to one’s wife, to spread slander or gossip, to share burdens, troubles, or worries unless his wife can actually help him or encourage him. 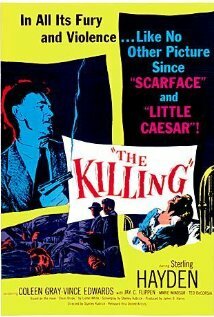 The Killing is a classic example of film noir, a film without heroes. The men who get involved with the heist occupy ordinary occupations and are not professional crooks. They are simply men driven to crime because of their own dire circumstances, some of which have been created by them and some of which have not. Clearly, however, the plot turns on the confessional conversation between George Peatty and his acquisitive wife Sherry, who, like Delilah in the Bible, exploits her husband’s secrets for personal gain. Watching the ensuing catastrophe reminds us that our conversations with our wives should not be concerned about material things alone. Conversation between spouses is good when it is purposeful, focused, and expressive of a deep, loving commitment to one another.